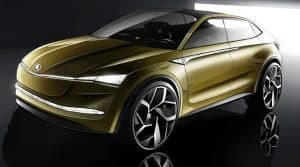 Skoda will introduce five new electric vehicles by 2025 and the Czech brand has provided a big clue to how they could shape up with a new concept car. Named Vision E, the five-door SUV coupe is about the same size as the recently launched Kodiaq SUV – a rival to the Nissan X-Trail and Kia Sorento – measuring at 4,645 mm long, 1,917 mm wide and 1,550 mm tall. It uses an all-electric powertrain producing 225kW – the equivalent of 310bhp – that can get it up to a top speed of 112mph, so it won’t be giving the 155mph Tesla Model S any sleepless nights. However, speed has been capped in the interest of squeezing out as many miles as possible from the powerful lithium-ion batteries. On a full charge and in the right conditions, the Vision E is said to be capable of driving up to 311 miles. Skoda’s first fully-electric car will follow in 2019, but before then, a plug-in hybrid version of the Superb will go on sale in 2018, which should have a healthy amount of interest from company car drivers, considering the success of the Mondeo rival so far. Aspects of the Vision E’s drivetrain are expected to influence that of the plug-in Superb. The concept car also showcases the brand’s self-driving technology. A combination of sensors and cameras means that the car can operate independently in traffic jams, go into autopilot on motorways, stay in lane and swerve obstacles, as well as carry out overtaking manoeuvres. It can even park itself in empty parking spaces too. The Vision E will receive its world debut at the Shanghai Motor Show on April 19th.